One of the most important correspondences that you have with clients is your invoices. They need to present vital information in a way that is both inviting and informative. Studiometry already has very powerful, completely customizable invoice templates that let you design and brand your invoices to exact specifications. 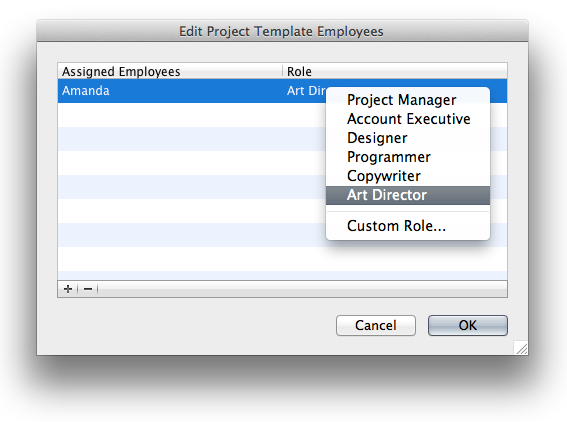 Studiometry 10 adds several powerful features to help organize and present the work and expenses within your invoices. New to Studiometry 10 is the ability to merge items on your invoices. Now, when creating your invoices, you can easily select two or more work/expense items and click the Merge button to have the items appear on the invoice as one combined item. Studiometry will calculate the total hours, quantity, and amount for you, and simply display one line item on the generated invoice. The merged items can be ordered, split, and organized however you’d like, giving you total flexibility with exactly how your items appear on the invoice. 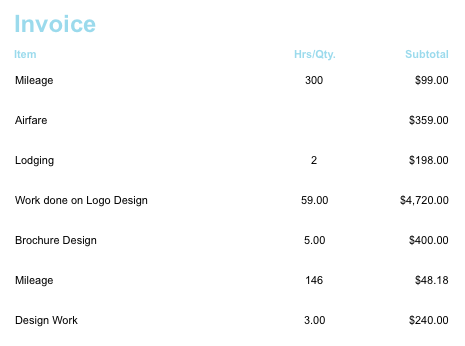 Here’s an example of an invoice with non-merged work items. As you can see, there are two entries for mileage, and three separate entries for design work. On an invoice, this will be presented showing every single line, which can be confusing for your clients to see multiple separate lines for similar items. This lets you present a simpler and easier to understand invoice, while maintaining the integrity of your data within Studiometry. Merging items is a great new feature, but what if there’s a category type that you want to always show as a combined amount? What if you always want your hourly work types to be shown as a combined subtotals, but you want your expenses to be listed out individually? Manually merging items on every invoice could become tedious very quickly. 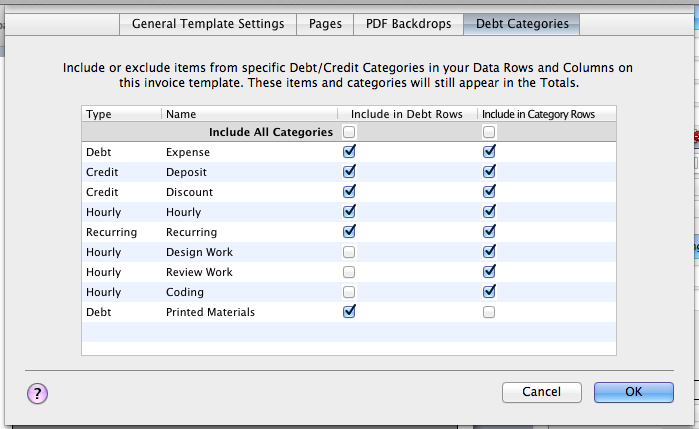 As you can see above, for each Debt Category you have the option to include it in the “Debt Rows”, and a separate option to include it in your “Category rows”. A quick reminder: your Debt Rows will show the work/expense items on the invoice, while the Category Rows will show combined amounts for each category type on the invoice. So if you want your hourly work types to be subtotaled without showing their individual work items, just uncheck the “Include in Debt Rows”, and be sure to check “Include in Category Rows”. You can design both your Debt Rows and your Category Rows to display however you’d like, and using the new Combo Data Rows feature, you can even have them display in-line with each other. These two new features can even be used together. All of your merged work items will appear in the Debt Rows, so you can merge certain items within your Debt Rows and automatically combine certain categories within the Category Rows. When it comes to tracking and entering your hours, Timesheets are the quickest way to add large amounts of work. If you forget to bill for a project, or even just one hour of work, you’re losing money. A great new feature for Studiometry 10 is the addition of Weekly Timesheets. This new interface shows you the amount of work you’ve done in the week, making it easier to visually realize and remember the work you’ve entered. You can quickly modify daily hours while Studiometry does all of the filing and sorting for you in the background. You simply select a Project and Work Type, and then Studiometry will present you with a display of the amount of work done, per day, for that Project. 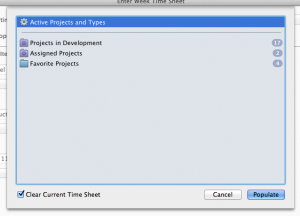 Once you select Populate, the Week Timesheet window will automatically add rows and select work types based on your selection, letting you can quickly add or modify your worked amounts. 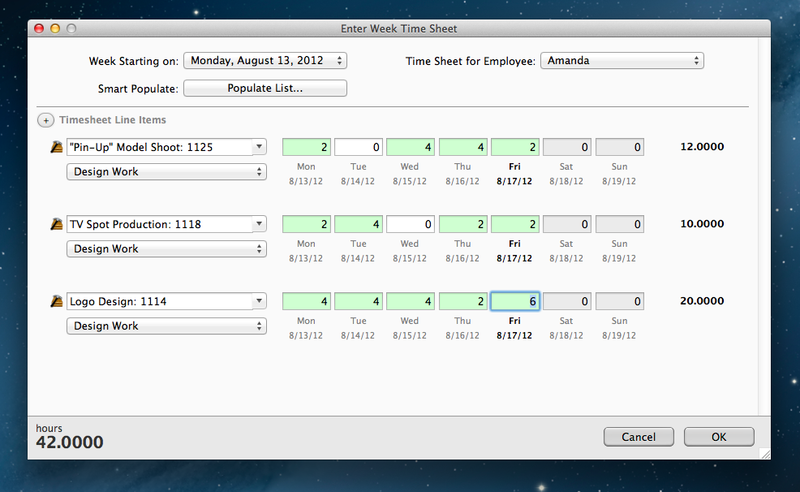 This new feature is a great way to help organize, view, and enter your company’s worked hours. Logging and entering hours can be a tedious task. The new Week Timesheet makes it a breeze.